Seriously, this is just gross! Would you eat this? I came across this this arvo and I just couldn't believe it. How bizarre and not just a little bit wrong! Despite the legal issues surrounding the funding of this 'innovative' new product, I just don't think I could eat a sandwich from a can. I mean those ones you get from the service station are bad enough and they are usually only there for a day or two. Imagine how long these bad boys are made to last. Can't be good for your health. Not surprisingly there is no nutrition information on the website, and I can't help but think, surely this is a joke?!? 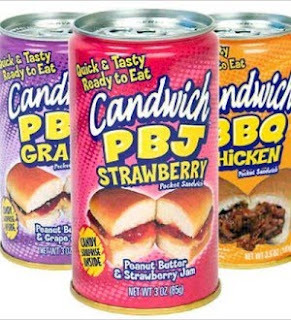 So, would you eat a candwich? God no. They probably would outlast a big mac in the desert for 50 years. Scary. You are soooo correct. Eeewww. Oh *puke* that is so gross. I'm shocked and a little nauseated.